The single most frustrating about the current state of esports, is how quickly we blitz through tournaments. This past weekend, the 2018 ELEAGUE Cup: Rocket League featured 13 best-of-seven matches that produced 75 games of Rocket League, all crammed into just three days. 21 of those games went to overtime and keeping them all straight in my head is impossible! I’d love to stretch these tournaments over the course of a week or so and enjoy each match to its fullest with all the attention and analysis they are each worth, but alas, practicality calls. If you happened to miss some of the crazy action this weekend, let me summarize the biggest things we learned about Rocket League at ELEAGUE. For me, the biggest question mark coming in to ELEAGUE was Dignitas. The world’s most consistent team had tripped and fallen at the World Championships. Would they get back up and immediately resume their breakneck pace, or did they twist their ankle in that incident? After ELEAGUE, it looks like the injury might be more severe than early diagnosis indicated. Dignitas’ group stage matches both went to game 7, and 8 of those games went to overtime. Dignitas has an overwhelming winning record against both Evil Geniuses and Flipside Tactics, but EG gave them a scare in Vegas going to game 5, then again in Atlanta, taking them all the way to game 7. Dignitas’ greatest strength has always been their ability to pull through even on the bad days, and that showed up on both days one and two. But the thing that gave Dignitas the energy to pull through on the bad days so often and saw them set records in the RLCS was just how much better they were than the rest of the world. Many of their victories this year weren’t just wins, they were dominations. In their seven league play matches for RLCS Season 6, they lost only four games. Flipside, the team right behind them, lost twelve for comparison. Dignitas weren’t just good, they were categorically and non-negotiably the best. But at Worlds, and then continuing into ELEAGUE, every day started to be a bad day. Yes, they would win, but every match was close, every opponent seemed like a challenge. Then Cloud9 snapped the win streak and took away the crown, and at ELEAGUE, the rough ride continued. Day three gave us a championship rematch of Cloud9 vs Dignitas and the story was exactly the same as before: Cloud9 beat Dignitas in a Best-of-7 in 5 games. For the third time in a row, Dignitas has fallen flat against NA’s best and they are starting to look beatable when playing everyone else as well. Dignitas was the first Rocket League dynasty, but the sun might be setting on their reign. 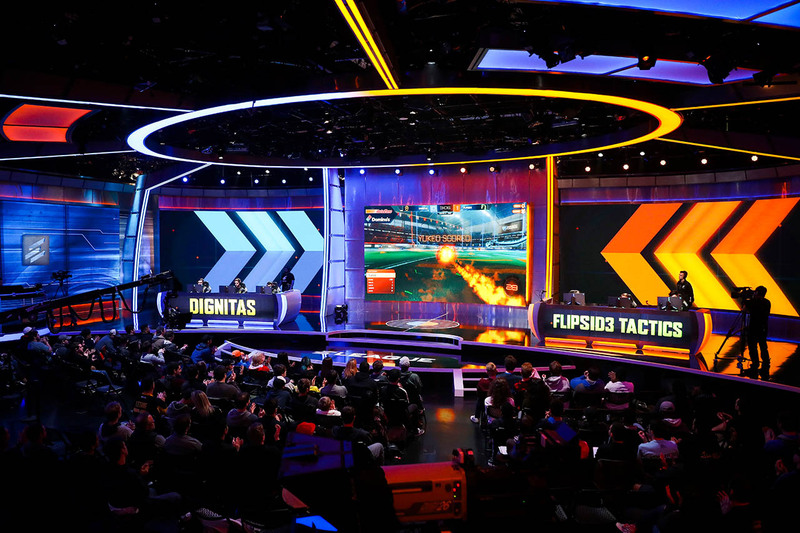 It tells you how dominant Dignitas really was this year, that I’ve gotten this far into this article without mentioning the winners the 2018 ELEAGUE Cup: Rocket League. The unsigned and underestimated We Dem Girlz came out of nowhere on Sunday to take the trophy, knocking out NRG and Cloud9 on their way to the top. Nobody predicted them to win any match on Championship Sunday, and honestly, they got predicted less and less as the tournament progressed. It wasn’t that the analysts thought WDG were bad, we all watched them pound their way through the upper bracket in Vegas. There were a few factors that put the desk’s confidence elsewhere. The first was just how good NA was playing. Cloud9 looked like they hadn’t dropped a beat since Vegas and NRG looked to be playing well again. Fireburner was having to play cleanup quite a bit, but the strategy was working, and we looked to be on course for our first ever NA vs NA finals. The second was how quiet We Dem Girlz’ performances were on days one and two. While they got the wins they needed, EyeIgnite in particular wasn’t super- involved. Multiple times, it was mentioned on the analyst’s desk that EyeIgnite was the key to success for We Dem Girlz, and multiple times we saw Metsanauris picking up the slack for the rest of his team. Heading into Sunday, the recipe for success didn’t seem to be baking a We Dem Girlz cake. NA looking hot? WDG’s key player sleeping? Surely, NRG gets a shot at the title here. But with all the attention focused on EyeIgnite, no one noticed how well Remkoe had been playing all weekend. Quietly leading from the back, Remkoe slowly controlled more and more of the game, with plays that weren’t reflected in stats. His control of the midfield and success winning challenges time and time again were giving We Dem Girlz the chance to score and giving EyeIgnite the space he needed to get warmed up. Against NRG on Championship Sunday, Remkoe also shined on the backline, making save after crazy save while his team tried to survive the North American giant. Game 4 was a turning point as Remkoe kept the net clean until 17 seconds left when they were already up by three. Eyeignite finally came alive, scoring two of those three goals and WDG was looking the best they’ve looked as they marched into the finals. But taking on the reigning world champs who had just beaten Dignitas for the third time in a row is a hard mountain to predict against. Once more, the desk put their faith in North America, and once again We Dem Girlz proved us all wrong. In dominating fashion, they defeated the RLCS champions, putting up a brazil in the final game to take the trophy in style. Cloud9 looked solid in game one, but from that point on We Dem Girlz had their number. From Game 3 on, WDG looked decidedly one-sided in the midfield as Remkoe and company out-read every move Cloud9 tried to make. 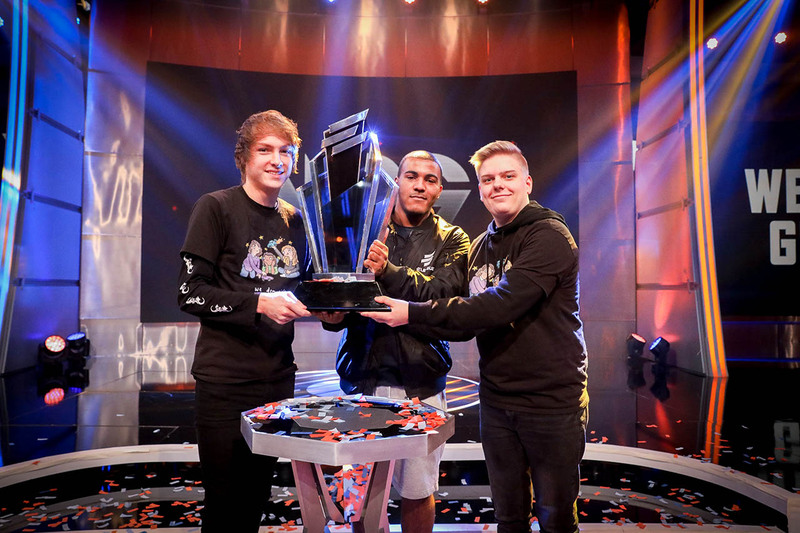 The ball hit the ground in game 5 and the unsigned team, rocking a name from the annals of Rocket League lore, hoisted a trophy while the hottest teams of 2018 watched from the side.